Brahe's systematic observations showed clearly that the object was far away and thus outside the Moon's orbit—it was a new object not previously observed. His continued observations over the next several months showed that the new star did not move relative to the planets. The world was convinced that the heavens now were changeable, and he published his observations in De Stella Nova in 1573, naming his new star a "nova." This nova, or new star, is now known to have been the supernova SN1572. ticus Heraclides in the fourth century b.c.e. The Tychonic system explained most of the observations of the motion of the planets, while still satisfying the powerful Catholic Church, which held that the Earth was the center of the universe. 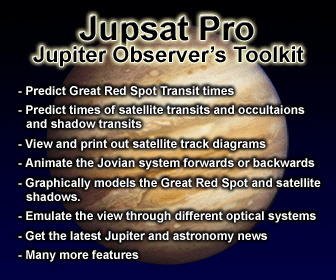 Brahe's observations were considered valid for some time after his death, as Kepler used Brahe's measurements of the motion of Mars to calculate the laws of planetary motion and to argue that the Copernican model with the sun at the center of the universe was correct and that the other planets and sun and stars were not orbiting Earth. Brahe, Tycho. "Astronomiae Instauratae Mechanica." 1598. European Digital Library Treasure. Gilder, Joshua, and Anne-Lee Gilder. Heavenly Intrigue: Johannes Kepler, Tycho Brahe, and the Murder Behind One of History's Greatest Scientific Discoveries. New York: Doubleday, 2004. Hawking, Stephen. The Illustrated On the Shoulders of Giants: The Great Works of Physics and Astronomy. Philadelphia: Running Press, 2004. Cambrian The first geologic period of the Paleozoic Era and the Phanerozoic Eon, the Cambrian began 544 million years (Ma) ago and ended 505 million years ago. It is preceded by the Late Protero-zoic Eon and succeeded by the Ordovician Period. The Cambrian System refers to the rocks deposited during this period. The Cambrian is named after Cambria, the Roman name for Wales, where the first detailed studies of rocks of this age were completed. The Cambrian is sometimes called the age of invertebrates. Until this century scientists thought the Cambrian marked the first appearance of life on Earth. As the oldest period of the Paleozoic Era, meaning "ancient life," scientists now recognize the Cambrian as the short period in which a relatively simple pre-Paleozoic fauna suddenly diversified in one of the most remarkable events in the history of life. For the 4 billion years before the Cambrian explosion, life consisted mainly of single-celled organisms, with the exception of the remarkable Late Proterozoic soft-bodied Ediacaran (Vendian) fauna, sporting giant sea creatures that all went extinct by or in the Cambrian and have no counterpart on Earth today. The brief 40-million-year Cambrian saw the development of multicelled organisms, as well as species with exoskeletons, including tri-lobites, brachiopods, arthropods, echinoderms, and crinoids. and 600 million years ago, then joined together in the new configuration of Gondwana, with the final ocean closure of the Mozambique ocean between East and West Gondwana occurring along the East African orogen at the Precambrian-Cambrian boundary. Even though the Gondwana supercontinent had formed only at the end of the Proterozoic, it was already breaking up and dispersing different continental fragments by the Cambrian. Closure of the Mozambique ocean in Neopro-terozoic times sutured East and West Gondwana and intervening arc and continental terranes along the length of the East African orogen. Much active research in the earth sciences is aimed at providing a better understanding of this ancient mountain belt and its relationships to the evolution of crust, climate, and life at the end of the Precambrian and the opening of the Phanerozoic. There have been numerous rapid changes in our understanding of events related to the assembly of Gondwana. The East African orogen encompasses the Arabian-Nubian shield in the north and the Mozambique belt in the south. These and several other orogenic belts are commonly referred to as Pan-African belts, as many distinct belts in Africa and other continents experienced deformation, meta-morphism, and magmatic activity in the general period 800-450 Ma. Pan-African tectonic activity in the Mozambique belt was broadly contemporaneous with magmatism, metamorphism, and deformation in the Arabian-Nubian shield. Geologists attribute the difference in lithology and metamorphic grade between the two belts to the difference in the level of exposure, with the Mozambican rocks interpreted as lower crustal equivalents of the rocks in the Arabian-Nubian shield. The timing of Gondwana's amalgamation coincides remarkably with the Cambrian explosion of life, which has focused the research of many scientists on relating global-scale tectonics to biologic and climatic change. The dramatic biologic, climatic, and geologic events that mark Earth's transition into the Cambrian are likely linked to the distribution of continents and the breakup and reassembly of a supercontinent. The formation and dispersal of supercontinents causes dramatic changes in the Earth's climate, and changes the distribution of environmental settings for life to develop within. Plate tectonics and the formation and breakup of the supercontinents of Rodinia and Gondwana set the stage for life to diversify during the Cambrian explosion, bringing life from the primitive forms that dominated the Precambrian to the diverse fauna of the Paleozoic. The breaking apart of supercontinents creates abundant shallow and warm-water inland seas, as well as shallow passive margins along the edges of the rifted fragments. As rifting separated continental fragments from Rodinia, they moved across warm oceans, and new life-forms developed on these shallow passive margins and inland seas. When these "continental icebergs" carrying new life collided with the supercontinent Gondwana, the new life-forms could rapidly expand and diversify, then compete with the next organism brought in by the next continent. This process happened over and over again, with the formation and breakup of the two Late Proterozoic-Cambrian supercontinents of Rodinia and Gondwana. North America began rifting away from Gond-wana as it was forming, with the rifting becoming successful enough to generate rift-type volcanism by 570 million years ago and an ocean named Iape-tus by 500 million years ago. The Iapetus Ocean saw some convergent activity in the Cambrian but experienced major contractional events during the Middle Ordovician. 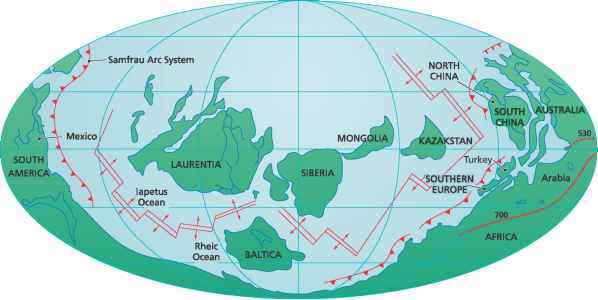 North and south China had begun rifting off of Gondwana in the Cambrian, as did Kazahkstan, Siberia, and Baltica (Scandinavia). 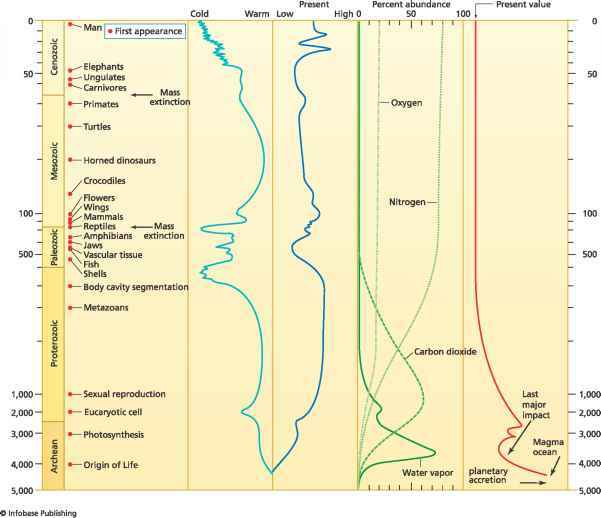 The margins of these continental fragments subsided and accommodated the deposition of thick, carbonate passive-margin sequences that heralded the rapid development of life, and some of which are now petroleum provinces. Burgess shale, which preserved organisms deposited in a lagoon that was buried suddenly in anaerobic muds, which so well preserved the organisms that even the soft parts show fine detail. Fossils from the Burgess shale and related rocks have revealed much of what we know about the early life-forms in the Cambrian and represent the earliest-known fauna. 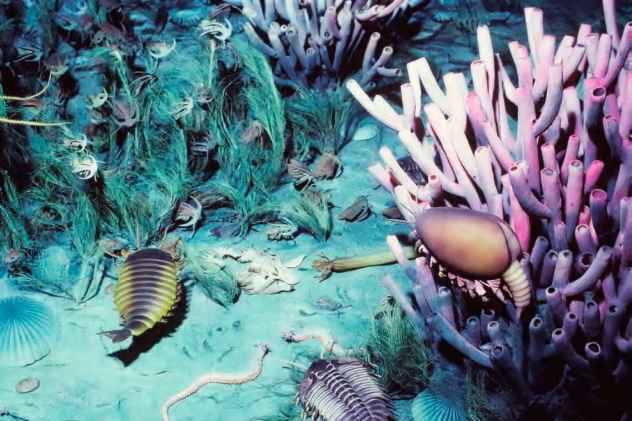 The Burgess shale has yielded some of the best-preserved jellyfish, worms, sponges, brachiopods, tri-lobites, arthropods, mollusks, and first invertebrate chordates. One of the important steps for the rapid expansion of life-forms in the Cambrian was the rapid radiation of acritarchs, small spores of planktonic algae such as green algae or dinoflagellates. The acri-tarchs were the primary source of food and the base of the food chain for the higher animals that later developed. Acritarchs appeared first during the Late Proterozoic, but 75 percent of all their taxa became extinct in the Late Proterozoic glaciation. The Late Proterozoic-Cambrian transition also saw the first appearance of trace fossils of soft-bodied organisms, showing that they developed and rapidly diversified in this period. Traces of worm paths are most common where they searched for food or burrowed into soft sediments. 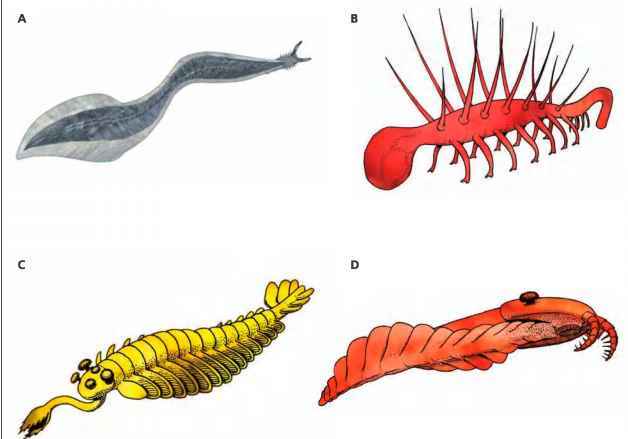 five major extinctions in the Cambrian, each one followed by an adaptive radiation and expansion of new species into vacant ecological niches. Other arthropods that appeared in the Cambrian include crustaceans (lobsters, crabs, shrimp, ostracods, and barnacles) and chelicerates (scorpions, spiders, mites, ticks, and horseshoe crabs). Mollusks also appeared for the first time at the beginning of the Cambrian, with the first clam (pelecypod) by the end of the Cambrian. Snails (gastropods) also emerged, including those with multiple gas-filled chambers. The cephalopods are other mol-lusks that had gas-filled chambers that appeared in the Cambrian. Echinoderms with hard skeletons first appeared in the Early Cambrian; these include starfish (asteroids), brittle stars (ophiuroids), sea urchins (echinoids), and sea cucumbers (holothuroids). See also Gondwana, Gondwanaland; Paleozoic; Precambrian; supercontinent cycles. Cowrie, J. W., and M. D. Braiser, eds. The Precambrian-Cambrian Boundary. Oxford: Clarendon Press, 1989. Gould, Steven J. Wonderful Life: Burgess Shale and the Nature of History. New York: W.W. Norton, 1989. 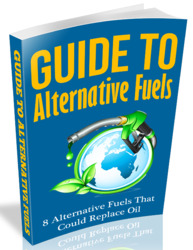 Kusky, Timothy M., Mohamed Abdelsalam, Robert Tucker, and Robert Stern, eds. "Evolution of the East African and Related Orogens, and the Assembly of Gondwana." Special Issue of Precambrian Research (2003): 81-85. Lipps, Jere H., and Philip W. Signor, eds. Origin and Early Evolution of the Metazoa. New York: Plenum, 1992. McMenamin, Mark A. S., and Diana L. S. McMenamin. The Emergence of Animals: The Cambrian Breakthrough. New York: Columbia University Press, 1989. Prothero, Donald R., and Robert H. Dott. Evolution of the Earth. 6th ed. Boston: McGraw Hill, 2002.
carbon cycle The carbon cycle is a complex series of processes in which the element carbon makes a continuous and complex exchange between the atmosphere, hydrosphere, lithosphere and solid Earth, and biosphere. Carbon is one of the fundamental building blocks of Earth, with most life-forms consisting of organic carbon, and inorganic carbon dominating the physical environment. The carbon cycle is driven by energy flux from the Sun and plays a major role in regulating the planet's climate. Several main processes control the flux of carbon on the Earth, and these processes are presently approximately balanced. Assimilation and dissimilation of carbon, by photosynthesis and respiration by life, cycles about 1011 metric tons of carbon each year. Some carbon is simply exchanged between systems as carbon dioxide (CO2), and other carbon undergoes dissolution or precipitation as carbonate compounds in sedimentary rocks. Atmospheric carbon forms the long-lived compounds carbon dioxide and methane, and the compound carbon monoxide, which has a short atmospheric residence time. Global temperatures and the amount of carbon (chiefly as CO2) in the atmosphere are closely correlated, with more CO2 in the atmosphere causing higher temperatures. Whether increased carbon flux in the atmosphere from the carbon cycle forces global warming or whether global warming causes an increase in the carbon flux remains undetermined. Since the industrial revolution, humans have increased CO2 emissions in the atmosphere, and this has also caused measurable global warming, showing that increased carbon flux can control global temperatures. The oceans are the largest carbon reservoir on the planet, containing more than 60 times as much carbon as the atmosphere. Dissolved inorganic carbon forms the largest component, followed by the more mobile dissolved organic carbon. The oceans are stratified into three main layers. The well-mixed surface layer is about 246 feet (75 m) thick and overlies the thermocline, a stagnant zone characterized by decreasing temperature and increasing density to its base at about 0.6-mile (1-km) depth. Below this lie the deep cold-bottom waters where dissolved C02 transferred by descending cold saline waters in polar regions may remain trapped for thousands of years. Cold polar waters contain more C02 because gases are more soluble in colder water. Some, perhaps large amounts, of this carbon becomes incorporated in gas hydrates, which are solid, icelike substances made of cases of ice molecules enclosing gas molecules like methane, ethane, butane, propane, carbon dioxide, and hydrogen sulfide. Gas hydrates have recently been recognized as a huge global energy resource, with reserves estimated to be at least twice that of known fossil fuel deposits. However, gas hydrates form at high pressures and cold temperatures, and extracting them from the deep ocean without releasing huge amounts of Co2 into the atmosphere may be difficult. Carbon is transferred to the deep ocean by its solubility in seawater, whereas organic activity (photosynthesis) in the oceanic surface layer accounts for 30-40 percent of the global vegetation flux of carbon. About 10 percent of the carbon used in respiration in the upper oceanic layer is precipitated out and sinks to the lower oceanic reservoir. The majority of Earth's carbon is locked up in sedimentary rocks, primarily limestone and dolo-stone. This stored carbon reacts with the other reservoirs at a greatly reduced rate (millions and even billions of years) compared with the other mechanisms discussed here. some cycles of this carbon reservoir are related to the supercontinent cycle and the weathering of carbonate platforms when they are exposed by continental collisions. Earth's living biomass, the decaying remains of this biomass (litter), and soil all contain significant carbon reserves that interact in the global carbon cycle. Huge amounts of carbon are locked in forests, as well as in arctic tundra. Living vegetation contains about the same amount of carbon as is in the atmosphere, whereas the litter or dead biomass contains about twice the amount in the living biomass. Plants absorb an estimated 100 gigatons of carbon a year and return about half of this to the atmosphere by respiration. The remainder is transformed to organic carbon and incorporated into plant tissue and soil organic carbon. Understanding the global carbon cycle is of great importance for predicting and mitigating climate change. Climatologists, geologists, and biologists are just beginning to understand and model the consequences of changes to parts of the system induced by changes in other parts of the system. For instance, a current debate centers on how plants respond to greater atmospheric Co2. some models indicate that they may grow faster under enhanced Co2, tending to pull more carbon out of the atmosphere in a planetary self-regulating effect known as the fertilization effect. Many observations and computer models are being performed to investigate the effects of natural and human-induced changes (anthropogenic) in the global carbon cycle, and to understand better what the future may hold for global climates. See also geochemical cycles; global warming; hydrocarbons and fossil fuels. Berner, Elizabeth Kay, and Robert Berner. Global Environment: Water, Air, and Geochemical Cycles. Upper Saddle River, N.J.: Prentice Hall, 1994. Brantley, Susan, James D. Kubicki, and Art White. Kinetics of Global Geochemical Cycles. New York: Springer, 2008. Carboniferous The Carboniferous is a Late Paleozoic geologic period in which the Carboniferous System of rocks was deposited between 355 and 285 million years (Ma) ago. The system was named after coal-bearing strata in Wales and has the distinction of being the first formally established strati-graphic system. In the United States it is customary to use the divisions Mississippian Period (355-320 Ma) and Pennsylvania Period (320-285 Ma), whereas Europeans and the rest of the world refer to the entire interval of time as the Carboniferous Period and divide the rocks deposited in the period into two subsystems, the Upper and Lower, and five series. The Carboniferous is known as the age of amphibians and the age of coal. The supercontinent Pangaea straddled the equator in the early Carboniferous, with warm climates dominating the southern (Gondwana) and northern (Laurasia) landmasses. In the Lower Carboniferous giant seed ferns and great coal forests spread across much of Gondwana and Laurasia, and most marine fauna that developed in the Lower Paleozoic flourished. Brachiopods, however, declined in number and species. Fusuli-nid foraminifera appeared for the first time. Primitive amphibians roamed the Lower Carboniferous swamps, along with swarms of insects including giant dragonflies and cockroaches. western United States. The Hercynian Orogeny in Europe marked the collision between Baltica, southern Europe, and Africa. In the Late Carboniferous (Pennsylvanian), Laurentia and Gondwana finally collided, forming the single large landmass of Pan-gaea. This collision produced the Alleghenian orogeny in the Appalachians of the eastern united states and the ouachita orogeny in the southern united states and south America, and formed the ancestral Rocky Mountains. In Asia Kazakhstan collided with Siberia, forming the Altai Mountains. 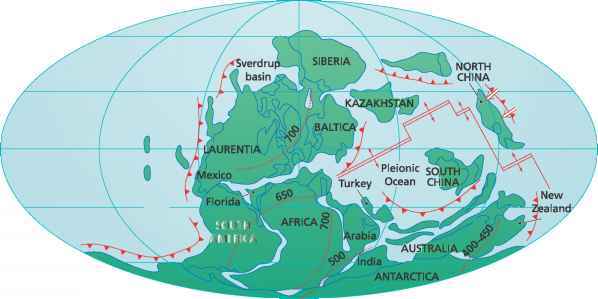 Several microcontinents were rifted off the Gondwana continents to be accreted to form much of present-day Asia. Global climates in the Carboniferous ranged from tropical around much of Laurentia and northern Gondwana, to polar on southern Gondwana, which experienced glaciation in the Pennsylvanian. This widespread glaciation formed in response to Gondwana migrating across the South Pole and is characterized by several advances and retreats and glacial deposits on Africa, Australia, South America, and India. Coal formed at both high and low latitudes in the Pennsylvanian, reflecting the warm climates from easterly trade winds around the closing Rheic ocean and future opening of the Tethys ocean. Most of the coal deposits formed in foreland basins associated with continental collisions. Many sedimentary deposits of the Carboniferous age worldwide show development in a repetitive cycle, including accumulation of organic material (vegetation), deposition of carbonates, deposition of clastic sands, and erosion to sea level and soil development. These types of sedimentary deposits have become known as cyclothems; they reflect a uniform fluctuation of sea level by 500-650 feet (150-200 m). Analysis of the ages of each cyclothem has led to the recognition that each cycle represents 300,000 years, but the cause of the repetitive cycles remains a mystery. They may be related to cyclical variations in orbital parameters (Milankovitch cycles) or to variations in the intensity of the southern glaciation. Extinctions in the Late Devonian paved the way for rapid expansion of new marine invertebrate forms in many ecological niches. Radiations in the brachio-pods, ammonoids, bryozoans, crinoids, foraminifera, gastropods, pelcypods, and calcareous algae became widespread. Crinoids were particularly abundant in the Mississippian, forming dense submarine gardens, along with reefs made of bryozoans and calcareous algae. Fusulinid foraminifera with distinctive coiled forms evolved at the beginning of the Pennsylvanian and serve as a useful index fossil since they evolved so quickly and are abundant in many environments. Land plants originated in the Devonian and saw additional diversification in the Carboniferous. Chordates, a prominent gymnosperm with long, thin leaves, flourished in the Mississippian, whereas conifers appeared in the Late Pennsylvanian. The tropical coal forests of the Pennsylvanian had trees that were more than 100 feet (30 m) tall, including the prominent Lepidodendron and Calamites trees and the seed-bearing Glossopteris shrub, which covered much of the cooler parts of Gondwana. Warm climates in the low-latitude coal swamps led to a flourishing fungi flora. 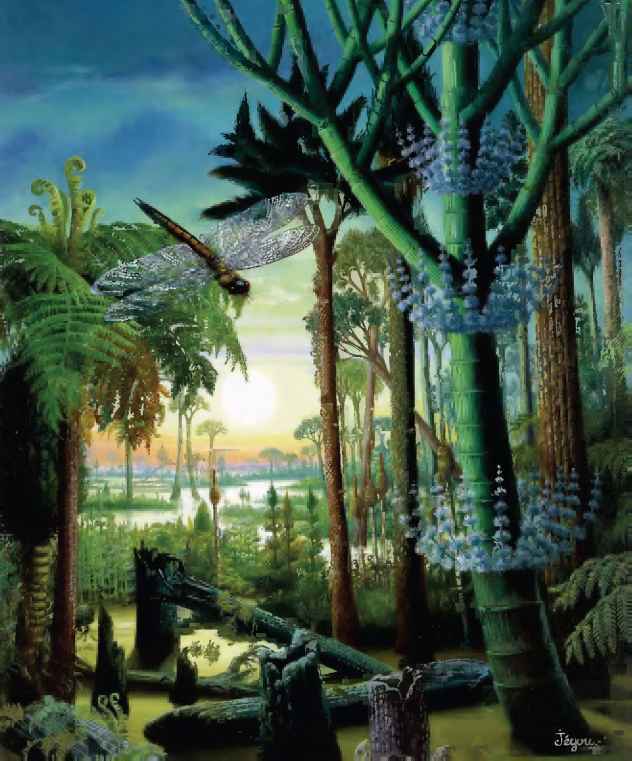 The dense vegetation of the Carboniferous led to high levels of atmospheric oxygen, estimated to have made up about 35 percent of the gases in the atmosphere, compared with present-day levels of 21 percent. The insects radiated in the Early Pennsylvanian and included the wingless hexapods and the primitive Paleoptera, ancestors of the modern dragonfly and mayfly. A giant Pennsylvanian dragonfly had a wingspan of 24 inches (60 cm) and preyed largely on other insects. Exopterygota, primitive crickets and cockroaches, appeared in the Pennsylvanian. Endop-terygota, the folding-wing insects including flies and beetles, did not appear until the Permian. The Carboniferous is famous for the radiation of amphibians. By the end of the Mississippian 10 different amphibian families had appeared, living mostly in water and feeding on fish. Eryops and other amphibians of this time resembled crocodiles, and include relatives of modern frogs and salamanders. Embolomeres evolved into large (up to 13 feet, or 4 m) eel-like forms with small legs, some living on land and eating insects. Leopospondyls remained in the water, eating mollusks and insects. The earliest known reptile, westlothiana, evolved from the amphibians in the Late Mississippian by 338 Ma ago. The transition from amphibians to reptiles occurred quickly, within a few tens of millions of years after the origin of amphibians. Amniotes are four-legged animals (tetrapods) that produced eggs similar to the modern bird egg, and include reptiles with scales. The rise of amniotes is a major evolutionary step, since the older amphibians underwent an early tadpole stage in which the young are vulnerable to prey. In contrast, the eggs of the amni-otes and later reptiles provided enough food for the growth of the embryo in a safer environment and lessened the dependence on water, allowing them to move further inland. Descendants of the amniotes include mammals and birds. The evolutionary transition between reptiles and mammals is gradual, with more intermediate evolutionary steps known than for any other high-order taxa. Like many other major evolutionary periods in Earth history, this evolutionary step occurred during a supercontinental amalgamation, enabling many species to compete. Many species intermediate between reptiles and mammals (the so-called mammal-like reptiles), and these dominated the land fauna for about 100 million years until the period of the dinosaurs began in the Permian. Mammal-like reptiles include two orders: Pelycosaurs and Thera-sids. The mammal-like reptiles had evolved into true mammals by this time but did not become dominant until the dinosaurs were killed off at the end of the Cretaceous. See also Gondwana, Gondwanaland; Milan-kovitch cycles; paleoclimatology; Paleozoic; Pangaea. University of California, Berkeley. "The Carboniferous." edu/carboniferous/carboniferous.html. Accessed October 30, 2008.
cave systems, caves Caves are underground openings or passageways in rock that are larger than individual spaces between the constituent grains of the rock. The term cave is often reserved for spaces that are large enough for people to enter. Some scientists use the term to describe any rock shelter, including overhanging cliffs. Many caves are small pockets along enlarged or widened cavities, whereas others are huge open underground spaces. The largest cave in the world is the sarawak Chamber in Borneo, with a volume of 65 million cubic feet (20 million cubic meters). The Majlis Al Jinn (Khoshilat Maqandeli) Cave in Oman is the second-largest known cave; it is big enough to hold several of the sultan of Oman's royal palaces, with a 747 flying overhead. Its main chamber exceeds 13 million cubic feet (4 million cubic meters), larger than the biggest pyramid at Giza. Other large caves include the world's third-, fourth-, and fifth-largest caves, the Belize Chamber, Salle de la Verna, and the largest "Big Room" of Carlsbad Cavern, a chamber 4,000 feet long (1,200 m), 625 feet wide (190 m), and 325 feet high (100 m). Each of these has a volume of at least 3 million cubic feet (1 million cubic meters). Some caves form networks of linked passages that extend for many miles. Mammoth Cave in Kentucky, for instance, has at least 300 miles (485 km) of interconnected passageways. While the caves are forming, water flows through these passageways in underground stream networks. acid (H2CO3) in rainwater reacts rapidly with the limestone (at typical rates of a few millimeters per thousand years), creating open spaces, cave and tunnel systems, and interconnected underground stream networks. Many caves are decorated with natural deposits of minerals that coat the cave walls, hang from the cave ceiling, or protrude upward from the floor. Spe-leothems are any secondary mineral deposit formed in a cave by the action of groundwater. Most spe-leothems are made of carbonate minerals such as calcite, aragonite, or dolomite, but some are made of silicates and evaporites. Dripstone and flowstone are the most common carbonate speleothems. Yellow, brown, orange, tan, green, and red colors in dripstone and flowstone are formed through staining by organic compounds, oxides derived from overlying clays and soils, and rarely by ionic substitution in the carbonate minerals. Dripstone forms where water enters the cave through joints, bedding planes, or other structures and degasses carbon dioxide (C02) from water droplets, forming a small ring of calcite before each drop breaks free and falls into the cave. Each succeeding drop deposits another small ring of calcite, eventually forming a hollow tube called a straw stalactite. Additional growth can occur on the outside of the straw stalactite, forming a wedge-shaped, hanging calcite deposit. Drops that fall to the cave floor below deposit additional calcite, forming a mound-shaped stalagmite. These have no central canal but consist of a series of layers deposited over each other and typically are symmetric about a vertical axis. Flowstone is a massive secondary carbonate deposit formed by water that moves as sheet flows over cave walls and floors. The water deposits layered and terraced carbonate with complex and bizarre shapes, with shapes and patterns determined by the flow rates of the water and the shape of the cave walls, shelves, and floor. Draperies are layered deposits with furled forms intermediate between dripstone and flowstone. Less common types of speleothems include shields, massive platelike forms that protrude from cave walls. They are fed by water that flows through a medial crack separating two similar sides of the shield, with the crack typically parallel to regional joints in the cave. 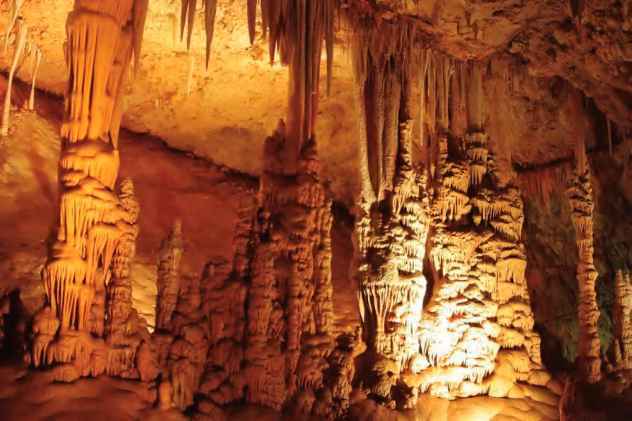 some speleothems have erratic forms not controlled by joints, walls, or other structures. Helictites are curved stalactitelike forms with a central canal; anthodites are clusters of radiating crystals such as aragonite and a variety of botryoidal forms that resemble beads or corals. Moonmilk is a wet powder or wet pasty mass of calcite, aragonite, or magnesium carbonate minerals. Travertine forms speleothems in cave systems in which the waters are saturated in carbon dioxide. Evaporite minerals form deposits in some dry, dusty caves where the relative humidity drops to below 90 percent and the waters have dissolved anions. Gypsum is the most common evaporite mineral found as a speleothem, with magnesium, sodium, and strontium sulfates being less common. Phosphates, nitrates, iron minerals, and even ice form speleothems in other less common settings. See also karst. Hydrology. London: Unwin-Hyman, 1989. Jennings, J. N. Karst Geomorphology. Oxford: Basil Blackwell, 1985. The Karst Waters Institute. Available online. URL: http:// www.karstwaters.org/. Accessed December 10, 2007. White, William B. Geomorphology and Hydrology of Karst Terrains. Oxford: Oxford University Press, 1988. Cenozoic The Cenozoic Era marks the emergence of the modern Earth, starting at 66 million years ago and continuing until the present. Also spelled Cainozoic and Kainozoic, the term Cenozoic is taken from the Greek meaning recent life and is commonly referred to as the age of the mammals. Cenozoic divisions include the Tertiary (Paleogene and Neogene) and Quaternary Periods, and the Paleocene, Eocene, Oligocene, Miocene, Pliocene, Pleistocene, and Holo-cene Epochs. Modern ecosystems developed in the Cenozoic, with the appearance of mammals, advanced mol-lusks, birds, modern snakes, frogs, and angiosperms, such as grasses and flowering weeds. Mammals developed rapidly and expanded to inhabit many different environments. Unlike the terrestrial fauna and flora, the marine biota underwent only minor changes, with the exception of the origin and diversification of whales. What is a plate tectonic and what is. biomass?